TORONTO FC SET an MLS record last night by securing the most points collected by a club in one season. The Canadian outfit drew 2-2 away to Atlanta United — with star men Jozy Altidore and Sebastian Giovinco both on target — to remain top of the Eastern Conference on 69 points. Former Sunderland striker Altidore bagged their first before running towards the opposing fans to celebrate. He was met with boos and one fan even launched a cup of beer in his direction. Giovinco responded by coolly picking up the drink and taking a swig. And the Italian schemer, a former MLS MVP, then curled a perfectly-struck free-kick beyond Brad Guzan — his 16th goal of the season. Who should be crowned the world’s best footballer at the Fifa Awards ceremony tonight? Email “Giovinco takes a swig of beer launched from the crowd at Toronto FC team-mate Altidore”. 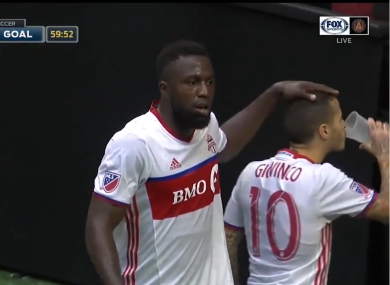 Feedback on “Giovinco takes a swig of beer launched from the crowd at Toronto FC team-mate Altidore”.